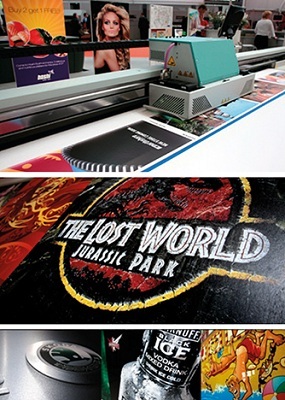 You may not even realise how many examples of wide format printing you pass on a daily basis. Hundreds, maybe even thousands, are in plain sight as you walk down any high street: On buildings, in shop displays, on vehicles, at bus stops. In shops, floor graphics guide our footsteps, three-dimensional POP tempts us to pick up and purchase, signs guide us to the products we want, special offers encourage us to buy what the shop wants us to. With new technological advances, printing—even wide format printing—can offer a fast turnaround time and economically sound runs. Like Rumpelstiltskin turned hay into gold, inkjet printing can potentially turn images into profit. Wide format generally refers to printing on media up to 5 metres wide. Print machines come in two basic formats: roll-fed for banners, wraps, textiles and other flexible materials, or flatbed for cardstock, board, Perspex, lenticular, glass, wood, metal, rigid PVC, Polystyrene and other stiff materials. When compared to other printing methods, such as litho and screen printing, inkjet offers a much simpler process. Nearly all of the time and cost of labour and consumables is eliminated since there are no screens or plates to prepare. The print machine is operated much like a desktop computer. Because the process is fast and easy to set up and operate, there is almost no delay when moving onto your next job. This means your inkjet machine can be running continuously—producing a profit nonstop. Inside an inkjet print machine, software converts each image into a series of ones and zeroes. These tell the print head where to jet a microscopic drop of ink, often referred to as drop-on-demand. Most wide format print machines use piezo-electric printheads. Inside the printhead, ink from a reservoir fills a tiny chamber. One of the walls of the chamber is made from piezo-electric ceramic. A minute electric charge is applied to the ceramic. Thanks to the unusual properties of this material, it changes shape in a predictable way, forcing ink out through a minute nozzle in the chamber and onto the substrate. For print machines working at high speed, the size of the drop is critical: too small and it gets buffeted by moving air; too big and the print definition suffers. Printheads contain many hundreds of nozzles, and digital print machines can have 8, 16, 24 or even more, printheads in an array. In wide format, print speeds are often measured by the number of square metres of print produced per hour. For bold headlines, usually the fastest speed is quoted, but print machines can be set to print at a range of speeds, with quality increasing as speeds decrease. What Materials Can Inkjet Print Machines Use? Inkjet print machines can produce products on a wide range of substrates. While rolled substrates are limited to just a few millimetres in thickness for obvious reasons, flatbeds can handle rigid media up to 50mm in depth. Flatbed print machines can print on paper, board, PVC film or rigid materials like acrylics or foam-centred board for graphic displays. They can even print on glass or wood – in fact any material up to their ‘ride height’. Your output is only limited by your imagination! Fujifilm, through its euromedia brand, sells a hand-picked range of more than 600 media covering every known application including low cost posters, indoor and outdoor banners, flags, exhibition graphics, sign-making, vehicle wraps, 3-D POP, backlit and art prints. Digital printing has gotten a bad reputation amongst traditional litho printers; they believe it is not good enough for their buyers. However, many of those buyers have already purchased inkjet print products for elements their campaigns call for that litho print machines cannot supply. To put inkjet into perspective, the most accurate digital print machines will produce 4-point reversed text with clarity, which is more than acceptable for close viewing, being roughly equivalent to 1,440 dpi. Printing technology has come a long way, and wide format printing offers a whole new world of opportunities. To learn more about how to make money with wide format printing, download this free guide today.